The Goodies Archive is a new interface to provide access to the activities that were offered for free download from the Learning Magic, Inc.® website. When Learning Magic closed its doors and its website, the download links for the Goodies disappeared. But this did not in any way affect the zip files for the free activities, which have been residing on one of my servers all this time. What I have done is re-upload the information about each activity, and re-establish its download link. If you often used the Goodies section on Learning Magic, these pages will look very familiar! So far I have made new pages for 101 of the IntelliTools Classroom Suite® free Goodies. That leaves about 33 Classroom Suite Goodies yet to do. There are also a few for Clicker 5® and My Own Bookshelf®. I hope to get these done in various odd moments, but I think there is enough material already re-linked to make it worth launching the Archive now. 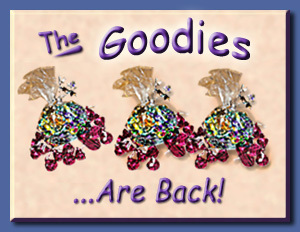 When you click the link below to enter the Goodies Archive, you are leaving Annie’s Resource Attic. But there is a return link in the Archive sidebar to come back to the Attic. I hope you enjoy having these activities available once again. For those who are hearing about the Goodies for the first time, you’ll be delighted with the variety of content there. It was just too good a resource to let it disappear! Level: Birth through High School. Goodies Archive link: Click Here. Collection of free activities formerly linked to the Learning Magic, Inc. web site.